Rabbi Arthur Schneier who witnessed the burning of his synagogue on Kristallnacht in Vienna, on November 10, 1938 met with Nicodemus Daoud Matti Sharaf, the Metropolitan Archbishop of the Syriac Orthodox Archdiocese of Mosul and Kirkuk who’s Church was devastated by ISIS. 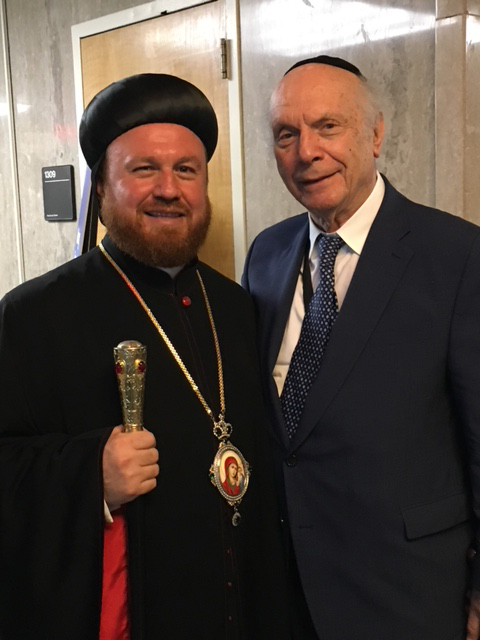 New York, N.Y. (July 27, 2018) – Rabbi Arthur Schneier; President and Founder of the Appeal of Conscience Foundation, Senior Rabbi of Park East Synagogue, addressed the U.S. State Department’s first-ever Ministerial to Advance Religious Freedom. The Ministerial included participants from eighty countries including faith leaders, foreign ministers and ambassadors who addressed the need to combat religious persecution and discrimination and to respect religious freedom for all. Rabbi Schneier who witnessed the burning of his synagogue on Kristallnacht in Vienna, on November 10, 1938 met with Nicodemus Daoud Matti Sharaf, the Metropolitan Archbishop of the Syriac Orthodox Archdiocese of Mosul and Kirkuk who’s Church was devastated by ISIS. Rabbi Schneier lauded the United States efforts on behalf of Pastor Andrew Brunson, an Evangelical Presbyterian Pastor from North Carolina, who was arrested in 2016 during a government crackdown on journalists, academics, and Christian minorities. Rabbi Arthur Schneier, Senior Rabbi of Park East Synagogue in New York City and founder of its Day School, (Rabbi Arthur Schneier Park East Day School), has served this leading modern Orthodox congregation for over fifty years. As Founder and President of the Appeal of Conscience Foundation (1965) he is internationally known for his leadership on behalf of religious freedom, human rights and tolerance was the first Rabbi to be awarded the U.S. Presidential Citizens Medal for “his service as an international envoy for four administrations” and “as a Holocaust survivor, devoting a lifetime to overcoming forces of hatred and intolerance,” and was recognized by the US Senate for his lifelong advocacy of inter-religious cooperation and peace. The Appeal of Conscience Foundation, founded by Rabbi Arthur Schneier in 1965, has worked on behalf of religious freedom and human rights throughout the world. The Foundation believes that freedom, democracy and human rights are the fundamental values that give nations of the world their best hope for peace, security and shared prosperity. The Appeal of Conscience Foundation has long held that “a crime committed in the name of religion is the greatest crime against religion.” The struggle for human rights and religious freedom is ongoing and can be achieved by promoting open dialogue and mutual understanding.